I'm so proud of our guys! Harvest time on any farm is a very busy season. Because of our diversification, we harvest 7 months a year, beginning in May, and ending, hopefully, in November. Soybeans are always the last crop to be harvested and it requires a lot of management on our part because we grow food/tofu grade soybeans, seed-grade soybeans, and feed-grade soybeans. (See my December 17, 2011 blog called "The Many Faces of Soy"). Equipment needs to be diligently cleaned between varieties and tracking which beans go into which bins and to which elevator. Its a bit of a juggle and something we try to get accomplished with minimal interruption. As with any farmer, we are anxious to be finished with harvest as soon as possible. We no longer have to worry about weather and the hand that Mother Nature deals us once everything is "in the bin". That's why I'm so proud of our guys who interrupted harvest on Friday, November 23, 2012. No, we did not go Black Friday shopping! 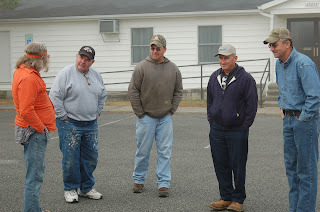 My husband, brother-in-law, myself, my son, daughter and nephew all joined together with others from our church and headed out on a mission trip 2 hours south to Deal Island, Maryland which was hit by Hurricane Sandy, but only recently (finally) declared a disaster area by the federal government. Friday was a gorgeous day. A PERFECT day for soybean harvest... and our combines stood still. Unheard of! We knew that the needs of these folks in Somerset County were falling through the cracks and want to contribute to the relief effort. Their needs took priority over our harvest. We're so happy we could help. 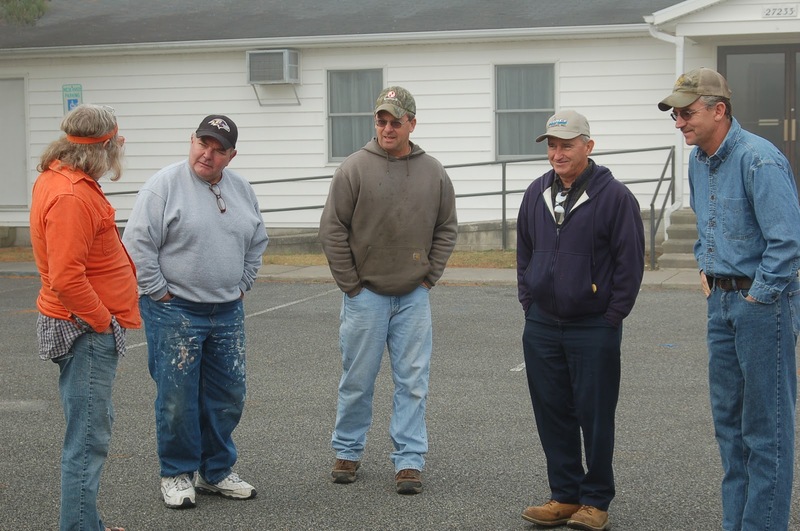 Some of the men who went on this mission trip, my husband in the center wearing a green sweatshirt and my brother-in-law on the far right. 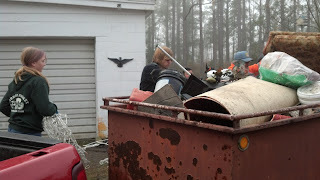 My daughter & son loading a trailer full of wet, moldy furniture, carpet and other unsalvageable items. Both are members of our church youth group. Cleaning up downed trees was one of our main jobs and these girls work hard! Our group of 18 did a good job tamping down the hump of roots left over from a fallen tree! My nephew on the right spreading tar on a metal roof to help stop the leaks. I call these "The Hurricane Kids" from our church youth group which I lead. 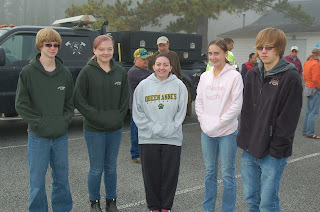 This is the 2nd hurricane relief mission trip we have done in as many years.